Ask Boston fans to name some life-long Red Sox and guys like Ted Williams, Yaz, and Johnny Pesky float to the top. 90 year-old Pesky, a.k.a. "The Needle," currently reigns supreme with--as of 2010--almost 60 years of Fenway service. Ted Taylor (H.R.T.) and Bob Schmierer (R.E.S. 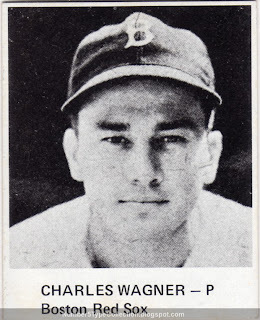 ), promoters of Philly's long-lived card show (PhillyShow.com), created this 36-card Play Ball "extension" to showcase a nice group of vintage player photos. Some card backs relive the WWII era with "Keep Baseball Going" or "Buy U.S. War Bonds." Others promote the card show itself. You could probably buy complete sets at the show or through the mail. 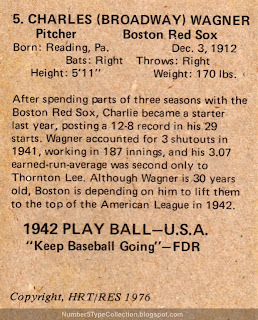 Value: As a "common," Charlie Wagner costs about $1. Stars like Gehrig, Williams, and DiMaggio run $5 to $10. Fake / Reprints: Other than being a spiritual "reissue" of past Play Balls, I've never seen actual reprints of this set in the market.